The four age-structural phases are described in the (U.S.) National Intelligence Council’s Global Trends reports (2008, 2012, 2016). 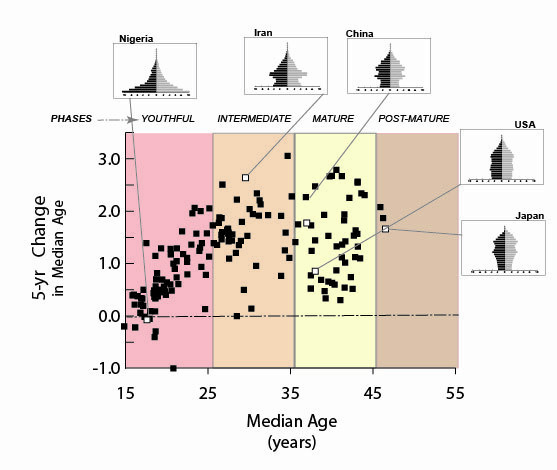 The phases (youthful, intermediate, mature, and post-mature) are described by ranges of median age (the age of the person in the population for whom precisely 50.00 percent of the population is younger). While no hard-and-fast borders exist between these categories, analysts find them useful for mapping and for narrative descriptions of conditions and processes. The four age-structural phases. From left to right, they are youthful, intermediate, mature and post-mature. The graph shows the positions of of the world’s states in 2015, in terms of median age, and the 5-year rate of change in median age (2010 to 2015). The path of the age-structural transition can be described as a non-linear influence on state capacity—in colloquial terms, a “bad-news, good-news, bad-news” story (Cincotta, 2012). Countries in the earliest, high-fertility portion of the transition experience youthful age-structures that present obstacles to attaining high levels of institutional capacity and state legitimacy (Dyson, 2010). In the intermediate and mature phases, working-age adults proportionately dominate the population. Then, in the post-mature phase of the transition, population aging. With more than half of their population composed of newborns, infants, school-age children, adolescents, and women in their peak childbearing years, demand for health and educational services in youthful states (so-called youth-bulge countries, median age <25.50 years) typically outstrips the state’s institutional capacity. Because annual growth rates among youth cohorts run high, children typically face school placement insufficiency and crowding, and low levels of societal investment per pupil (Lee & Mason, 2011). Meanwhile, young adults in these countries typically endure intense competition for jobs and underemployment (Easterlin, 1968). Politically difficult to manage, youthful populations tend to feature locally powerful extended family and patronage networks (Wusu & Isiugo-Abanihe, 2006), and an elevated risk of intra-state conflict and other forms of political violence (Goldstone, 2012; Urdal, 2006; Goldstone, 2002; Mesquida & Weiner, 1999; Möller, 1968). The four age-structural phases experienced by Japan (1935, 1970, 1990, 2025 (projected). Countries that advance into the intermediate phase of the age-structural transition (median age 25.50 to 35.49 years) experience lower proportions of their population among cohorts of dependent children, and higher proportions in the productive, and taxable, working ages (a worker bulge). This transformation, typically the result of fertility decline below 2.5 children per woman, has been associated with improvements in health status, increased per-child investment in schooling (Lee & Mason, 2011), growth in savings (Higgins & Williamson, 1997), increased participation of women in the economy (Bauer, 2001), and often a faster pace of economic development—what has been termed the “demographic dividend” (Bloom et al., 2002; Birdsall & Sinding, 2001). Economic growth rates tend to slow as states enter the third phase of the age-structural transition, the mature phase (median age 35.50 to 45.49 years). 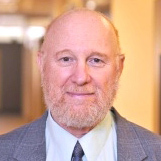 Despite an aging workforce and a growing group of retirees in mature states, favorable economic and political conditions often prevail—a so-called “second demographic dividend” (Lee & Mason, 2006), a situation typically associated with states that amassed human capital during the intermediate phase. In the final phase of the age-structural transition, states incur another challenging set of distributions: a series of post-mature age structures (median age 45.50 or greater) characterized by a large proportion of seniors and dependent elderly, and declining numbers in the younger working ages. Whereas by 2016 only three states—Japan, Germany, and Italy—have entered this category, some researchers hypothesize that, as a group, future post-mature states will face declining per-capita productivity, fiscal imbalances (Jackson & Howe, 2008), substantial foreign debt (Eberstadt & Groth, 2010), and constrained participation in the international system (Haas, 2007).